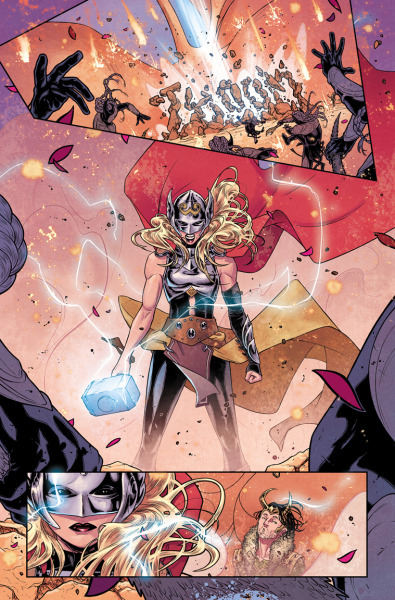 Russell Dauterman has taken Marvel comics by storm with his work on the groundbreaking female Thor series. 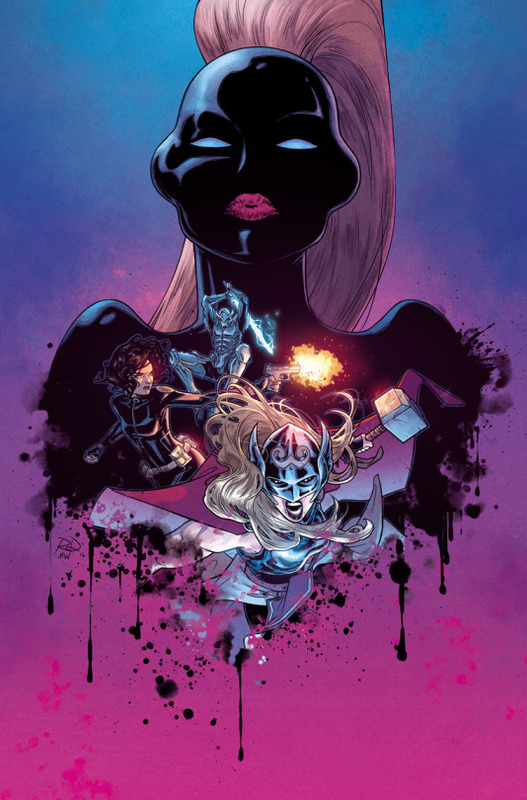 At Wondercon 2016 in Los Angeles, I had the incredible opportunity to sit down with my favorite comic book artist Russell Dauterman (The Mighty Thor) to talk about his work on this smash-hit Marvel series combining might and modern myth into a true epic. The Geek Initiative: First things first, just a fun question. Are you left or right handed? TGI: Do you prefer coffee or tea? RD: I don’t drink either. I really don’t drink caffeine at all. I was overweight in middle school and high school, and so to help lose the weight I cut out all soft drinks and pop and all that, and after that I never went back to them. TGI: So what do you do to keep your energy up? RD: I don’t. [laughs] I try to exercise every morning, and I try to eat every three hours. TGI: Was there any series that you had growing up that particularly inspired you and your work? RD: I mean, the reason I got into comics at all was because of X-Men the Animated series. I think because the characters on the cartoon show looked exactly like the characters in the comics, I was able to go right over to the comics and pick those up. Uncanny X-Men was my favorite. TGI: Do you have a favorite X-Men character? RD: Rogue is probably my favorite. Storm is tied with her for number one. TGI: The Geek Initiative is all about celebrating women and diversity in geek culture- do you have a favorite female character within of the realm of Thor? RD: Well, I’d probably have to say Thor herself. I really love her, and I love now that the secret identity has been revealed as Jane and we really get to see that whole side of her life, play up the dichotomy between the two of them. I just think that the struggle that Jane is going through puts such a fascinating wrinkle into the Thor mythology, to have her be the hero. So, yeah, she totally has to be my favorite. But Karnilla is a close second. TGI: Has anything changed in the way you approach Jane’s character for the Mighty Thor series now that her thunderous secret is out? RD: You know, I don’t think so because I knew that it was Jane going into it. So, I knew that I wanted them to be very physically distinct. If anything now I am playing up those visuals more. Thor is more muscular, she stands very tall and is very sure of herself. Very confident. But when you see Jane, she is so weighed down by her illness and she’s thin and weak. I don’t think much has really changed, except accentuating those things a bit more. TGI: Were there any other artistic outlets you worked in before comics? Or did you always want to do comics? RD: I always wanted to do comics, but it was kind of a circuitous route. I interned at Marvel in college, but at the same time I was very interested in costume design. I ended up going to graduate school for that, and while all that was happening, I was illustrating children’s books. So it was a mix of things. But in graduate school, I really found that while I loved designing things, it was really the illustration part of it that I loved the most. And I always kept coming back to comics, as something I wanted to do. I never really thought I was quite good enough to do that- and I probably wasn’t. Looking at some old sample pages, I’m sure I wasn’t. But I went to UCLA for grad school and one of my professors there ended up doing part of the costume design for the Captain America movie, the first one. He hired me to be a sketch artist on that. A lot of costume designers, especially for films, will hire illustrators to draw out their ideas, and that’s what you present to directors and such. I enjoyed that, but it wasn’t quite for me. I felt that comics were what I really needed to do. Doing that job got me into San Diego Comic Con, and I put together a portfolio for that and started to meet editors there. And that kicked everything off. 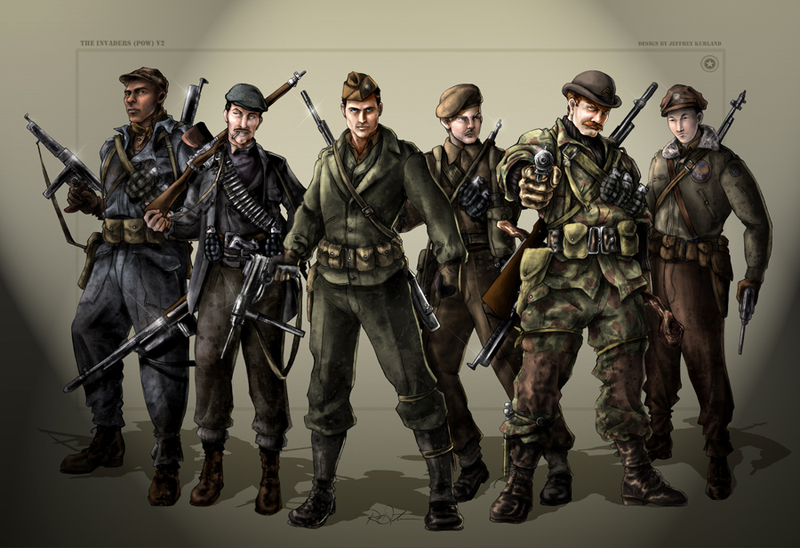 Costume illustrations from Captain America: The First Avenger. Designs by Jeffrey Kurland, illustration by Russell Dauterman, 2010. TGI: Do you like to have any sort of background noise going on while you draw? Television or music? Yeah. I can’t really watch TV when I’m working, but I’ll have the news on. I’ll have Anderson Cooper on in the afternoon, but mostly it’s music or podcasts I love to listen to. Especially when I’m inking, I need a bit of a distraction. When I’m doing layouts, I don’t listen to anything since I am trying to just focus on that. But more of the routine stuff, I definitely like to listen to something. TGI: You’ve done a few previous series involving superheroes and outer space. How does the action and superheroism of Thor differ from Supurbia or even Cyclops? RD: With Cyclops, so much of what Greg Rucka wanted to do with the series, and what I wanted to do with it, was show Cyclops as a teenager. All of his physicality was much more rooted in real life stuff, and trying to make him seem like a fish out of water in these cosmic, crazy circumstances. So I tried to play that up a lot more with him being a regular person in the way he stood and how he dressed. I think only in the first issue is he in his regular superhero outfit- I only did three, but you know. And similarly, with Supurbia, the superheroes were a part of it, but the main focus was the wives and husbands and kids. It was very much superhero-adjacent. And once you get to Thor, that’s full on superhero and tons of mythology and fantasy. So it’s a bit less of the realism. That’s why in the moments when you see Jane and you see her really as a real person, it contrasts so much with everything else that’s going on. TGI: It kind of got Game of Thrones-y as of late. RD: Oh yeah. Well, I do love Game of Thrones. You know, reading Jason and Esad Ribic’s God of Thunder, that felt so Game of Thrones-y, and I really wanted to carry some of that that over. And Disney and all sorts of fantasy stuff was my childhood, so I love to add those touches in. TGI: One of the really cool things you do well in your artwork is hair- it almost has a life of its own on the page. Is that something you really like to focus on and work with? RD: Oh yes. I love hair! [laughs] Sometimes when I’m inking it and doing all the little cut-outs and stuff, I’d say I don’t love it, but I really do love it. I feel like you can add so much drama and character with it. Malekith is 90% hair. It is such an extension of him, and I think you can tell so much. With costume design and character design in general, every detail you put on the figure can tell you something about their personality. So if you look at Malekith’s hair, well, I wouldn’t say that it’s attractive. It’s flat against his head and sleek and slick kind of like he is. It’s off-putting, and it slithers around behind him. So anything like that can really add a lot to a character. With Thor, you know, you want her to be this goddess, and you want her hair to be flowing and her cape to be flowing. To contrast that with the muscles, I think that just creates a very strong but feminine aesthetic that’s important for her. TGI: And you still manage to get so much expression out of Jane, who doesn’t have any hair. RD: Right. Yeah, I think the lack thereof says a lot too. It’s pretty striking to look at her and not see eyebrows or hair. TGI: You get to draw from famous characters’ costumes from throughout the Thor legacy for your current book- is there any one character redesign for the series that you think is most “you”? Or is there any one you had the most fun with? RD: Well, one I really love we haven’t seen much yet is the Queen of Cinders. TGI: I’m excited for her! RD: I’m excited for her too! I was telling Jason, I’m anxious for her to show up. We’ve seen her on some of the covers. She obviously draws parallels to Surtur, but I’ve tried to make her unique, and to tie her to her minions. I love those little fire demon guys also. To answer your question, that feels very ‘me’. Also, the light elf queen, Aelsa. Her wedding dress I had a lot of fun with. It’s a fun mix of science fiction and fantasy, and some period costumes. I love doing all that. TGI: Do you have a favorite scene that you’ve drawn? That Jason has written/Matt has colored? RD: Well, my favorite scene that Jason has written, I probably shouldn’t say, but it happens in issue 5- the one with Loki. I read that in the script and you know, almost gasped. I thought that was excellently done. 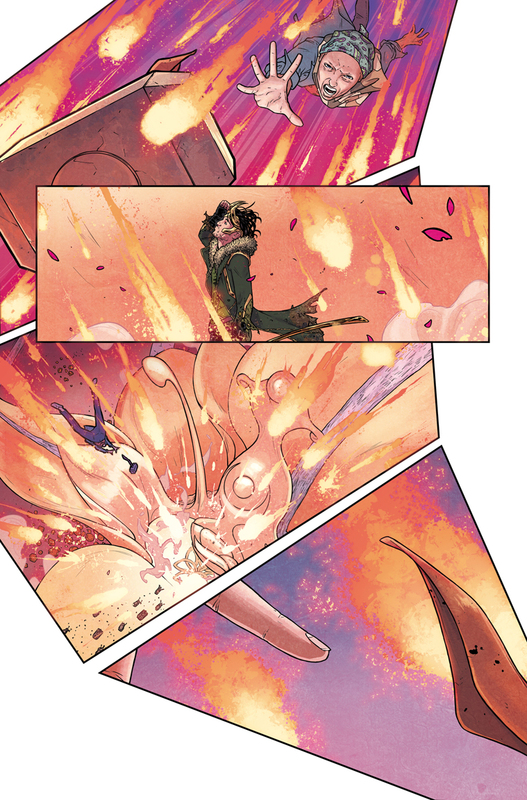 The favorite that I’ve drawn I think is also the favorite that Matt’s colored…the one coming to mind right now is the opening of issue 4 of the Mighty Thor, where Jane is falling down into Alfheim. I did the panels that were circular, and the circular kingdom in the middle, and all the fire from the explosions going toward castle. And then the following page, where she keeps falling and reaches for the hammer. And the third page which concludes that set, where she’s crashed and she’s transformed into Thor. 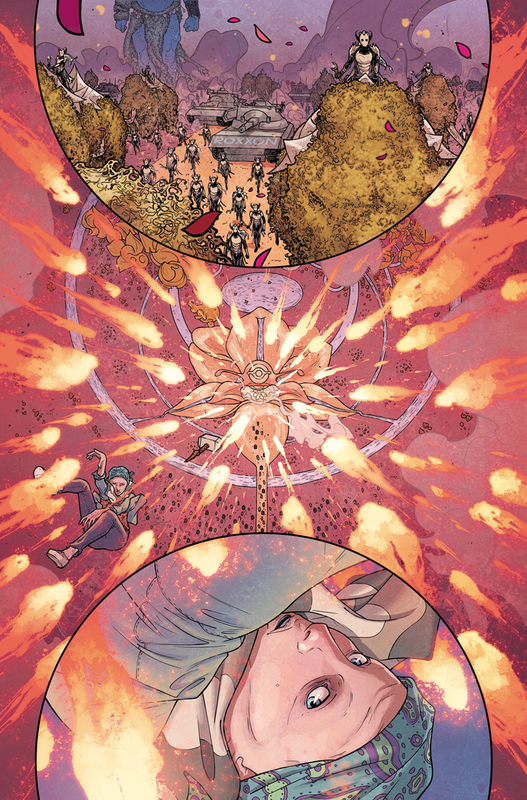 I loved drawing that and Matt’s colors blew me away on that. It’s really phenomenal to see what he does. TGI: You guys have a great synergy. Now, for the final question, it’s needless to say, the Thor universe is so much bigger than we’ve seen so far. At the end of the last issue, you guys dropped quite a few bombshells about the state of affairs in the ten realms. TGI: Now we’re getting a Throwback Thorsday with a guest artist. When you’re back on the story in June, I know you know this, but what sort of new world-building can we hope to see, and what direction do you think the Thor saga is headed? RD: Well, I’m actually still in the story for 6 and 7. I’m doing the present-day sequences. Issue 6 starts with present day, then there’s flashback, and then issue 7 ends with present day. So I’m doing the bumper on each one to help make everything seamless. The artist doing the flashback is Rafa Garres, and he’s doing this incredible painterly stuff that is going to be brilliant for the flashback. The cover for The Mighty Thor #9 (July 2016). Dauterman previewed this image at his spotlight panel. But going forward, issue 8 actually starts an arc that’s set on Midgard. So we’re picking up with Jane, and more of what her superheroing is like on Earth. There’s S.H.I.E.L.D. involved. The solicit text alluded to some corporate espionage that will be going on, so you could guess that maybe Dario Agger will be involved. We’re picking up the threads from there, and I’m sure the other threads will be woven in also. Jason really wanted to let everyone explore what Jane’s been doing on Earth. Since as much as she’s been fighting in the ten realms, she’s also defending Midgard. It’s exciting. I did a redesign of a villain who’s going to show up that’s pretty exciting too. I can’t say anything really, but there’s a few cool Marvel bad guys I got to draw. They have a fun meeting. TGI: Well, thank you so much. Really great stuff. RD: Thank you very much! Russell Dauterman currently is the artist for the Marvel series The Mighty Thor, written by Jason Aaron with colors by Matt Wilson. 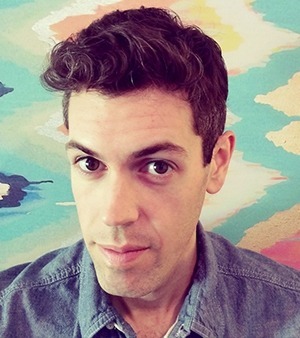 He has previously worked with this team on Thor (Volume 4) for Marvel. 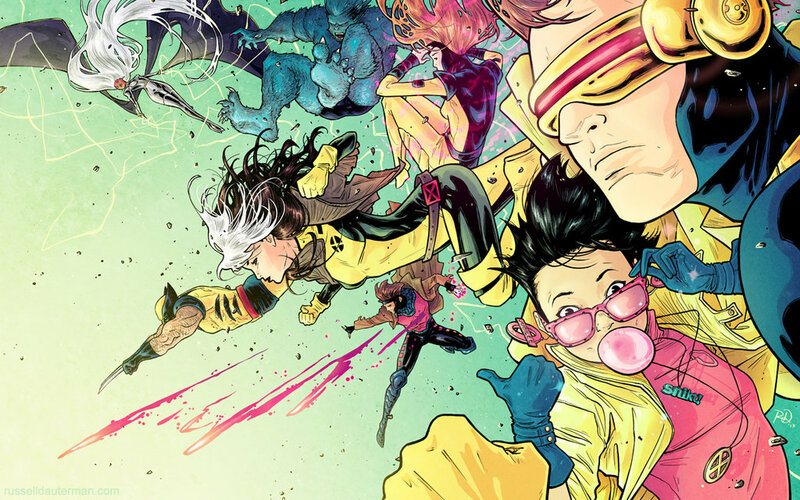 Russell has also worked on Cyclops (Marvel), Nightwing (DC Comics), and Supurbia (Boom Studios). You can follow Russell on Twitter under the handle @rdauterman, on Tumblr, and at his website, where you can purchase original pages and view his previous projects.